Crossmaglen is never an easy venue to have to travel to in search of points. Especially when the home side are hurting after a first round defeat to Meath. Everybody knew that Westmeath would be up against it last Sunday as they travelled in search of their first brace of league points. Yet nobody could have envisaged the humiliating hammering which was dished out to them by a rejuvenated Armagh side. Seventeen points was the difference between the sides at the end of what can only be described as a mismatch. Armagh will be delighted to have collected their opening league points in such emphatic manner in front of their home support. Midfielder Charlie Vernon and Aaron Kernan who operated at centre forward, were impressive throughout. Yet it was Steven McDonald who stole the show with an exhibition of point-scoring, finishing with a personal tally of 1-9, all from play. For Westmeath however the manner of this defeat raises serious questions. The opening twenty minutes against Donegal aside, there has been little to cheer about from a Westmeath point of view. The opening two games have seen Brendan Hackett’s men concede 3-32 while at the other end we have only managed to score 17 points over the two games. Denis Glennon has bagged 0-9 over the two games meaning that the rest of the forwards combined have contributed just eight points. Unless that issue can be addressed then one would have to be fearful for the remainder of the year. To win any game at any level you need to be hitting 13 or 14 points a game. The midfield sector is another problem area for Westmeath that needs to be addressed. If we are not winning enough primary possession here then our management needs to devise another strategy that might work. It is very easy to start making excuses and point to the fact that we have lost Dessie and Martin Flanagan and that Fergal Wilson is still out injured but Armagh too are supposedly in transition. Excuses won’t get us the league point we need to stay in Division 2. Brendan Hackett and his backroom team need to get their act together and quickly. Martin McHugh predicted before the league began that Westmeath would be relegated and now that looks increasingly likely. Indeed it not beyond the bounds of possibility that they could end the league without a win. Meath are next up away, and considering they have already beaten Armagh they will be warm favourites. Laois at home is a game Westmeath will have to take something from if they are to have any hope of avoiding relegation. Laois were handed a 15 point drubbing by Donegal so obviously have problems of their own. Kildare got back on track last Sunday away to Tipperary and will be a tough nut to crack in Newbridge. 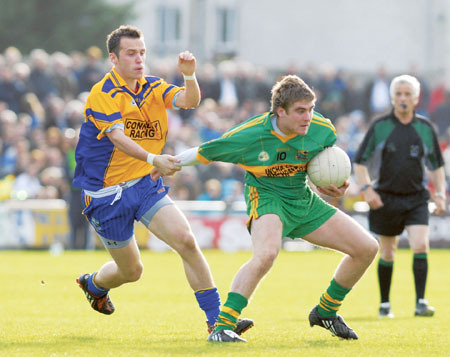 Down then come to Mullingar and considering the form they have shown thus far will be pushing for promotion. Tipperary away is the last game of the campaign and again this is a must win if Westmeath are to stay up. Tipp have yet to win a game but are a much improved side since Westmeath travelled south for the qualifiers two or three years ago. On current form I couldn’t see Westmeath beating any of the above teams. Hopefully with a break until March 3, all involved will have a chance to do some soul searching and produce an improved performance in Navan on Sunday week. Having been involved with Westmeath teams that have suffered heavy defeats in the likes of Crossmaglen, Omagh, and Castlebar in the past I know it’s not easy to turn things around. A bad league campaign saps confidence and is rarely followed by a good championship campaign. All the more reason for Brendan Hackett and co to get their house in order. Westmeath’s under 21 footballers have an opportunity to lift morale of football followers in the county when they welcome Kildare to Cusack Park on Saturday at 2pm. Kildare are always very competitive and can be expected to mount a serious challenge. Yet with home advantage allied to the potent threat posed by the likes of Conor Lynam, James Durkan, Thomas McDaniels, Ian Coffey, and John Egan and Callun McCormack I expect the home side to shade it. Westmeath collected their second Keogh in as many years thanks to a well deserved win over Kildare last Sunday. Four points separated the sides in the end but Kildare will rue a number of missed opportunities during the second half. Westmeath were reduced to 14 players when Enda Loughlin received his second yellow. Considering Brendan Murtagh and Paul Greville were both missing, the win was all the more noteworthy. It must be said that Westmeath retained the silverware while playing well within themselves. Kevin Martin will be looking for a big improvement as his side take on Wexford in the first round of the National Hurling League this Sunday in Cusack Park. With Murtagh and Grevilleexpected to be back on board and confidence high after collecting some early season silverware, his side will be hoping to ambush the Yellow-bellies. They’re not without a chance. The backlash I predicted here last week from Roscommon nearly materialised as Fermanagh needed an injury time goal to steal victory from the jaws of defeat. It was rough justice on a Roscommon side who deserved to take something from the game. The sides were level 0-4 apiece at the break. It was the home side who took the initiative in the second half racing into a 1-5 to 0-4 lead. Donie Shine and co showed admirable resolve however to claw their way back and edge in front. Shine kicked 6 second half points. Yet James Sherry spoiled the Rossies party with an injury time goal. Disappointment yes, but plenty of positives for Roscommon people to mull over.